When I make bacon, the end pieces are strongly smoked and aren’t nice cooked on their own. So, I decided to use them to make Bacon Barley Soup. Don’t worry if you don’t smoke your own bacon, you could substitute regular bacon or back (Canadian to Americans) bacon. I started by heating the oil up over medium heat in a large pot. I added the bacon and sauteed until it started to colour. Then I added the onion and sauteed until a nice dark fond (a coating on the bottom of the pan) starts to form. Then I added the garlic and the herbs and sauteed just for a few seconds until the herbs started to give off a nice smell. Then I added the chicken stock, soy sauce and Sriracha sauce. 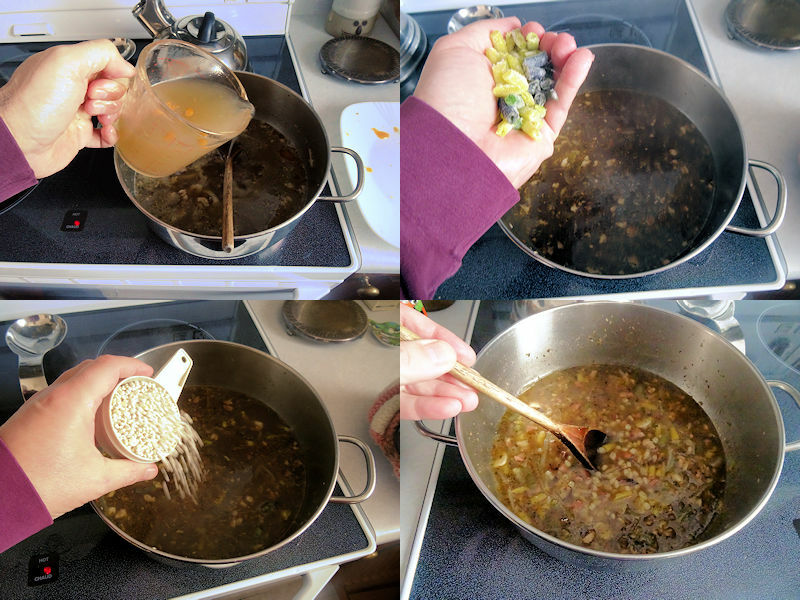 I brought the soup to a boil and then reduced the heat to a simmer. I simmered it for an hour. Then I added the green beans and the pot barley and simmered for another 45 minutes. This turned out great. The smokiness of the bacon adds a wonderful complexity to the soup together with the saltiness and touch of spice from the Sriracha. I will be making this again. 250 ml (1 cup) onion, cut in half lengthwise and then sliced. Sautee the bacon just until it starts to colour. If using regular bacon, drain off excess fat. 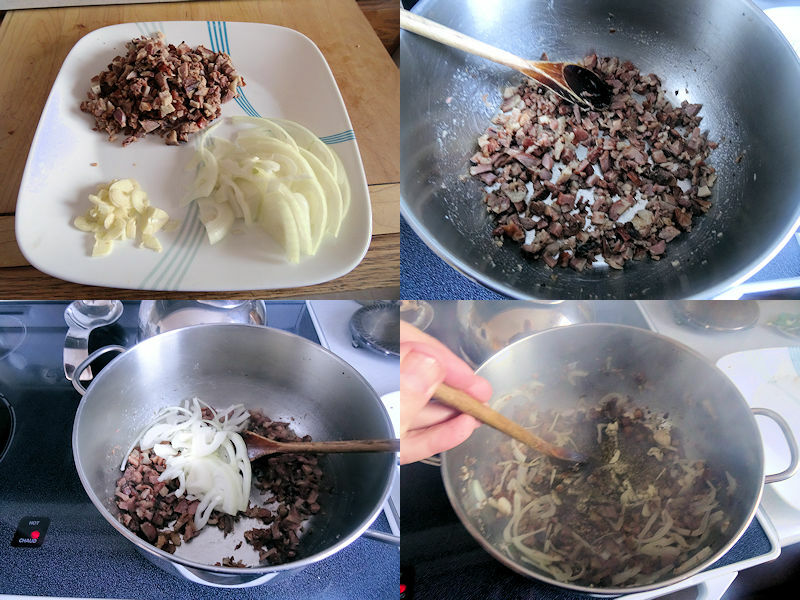 Add the onion and sautee until a dark (not black) fond (coating on the bottom of the pan) forms. Add the garlic and herbs. Sautee for a few seconds until the herbs give a nice fragrance. Add the chicken stock, soy sauce and Sriracha sauce. Add the vegetables and barley. Simmer for 45 minutes. This is exactly the kind of recipe I need in my life – a big pot of delicious soup! I love barley and I imagine the bacon makes this so tasty. I do not smoke my own bacon so thanks for the tip for us “non-smokers” 😉 I have a big canister of barley in the pantry and this will be its fate! Thanks for the recipe David! Seems to me there is a lesson here. Start smoking. I love barley in a soup. It just makes it comfort food to me. I hope you like it. Cold weather makes me want to stay indoors, read a good book, and drink hearty, healthy soup. Ah, I know exactly what you mean. Wow! 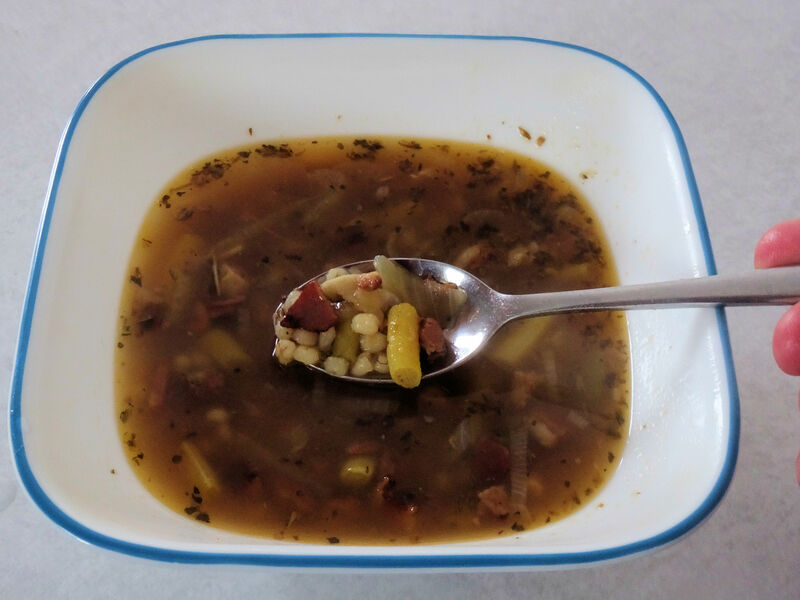 This is a great one for the cold weather, I love the combinations you have in this soup. I can taste it right now!!! Thanks, Sam. 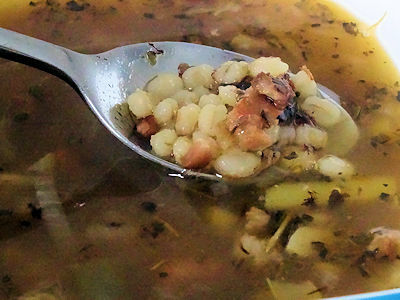 I am a barley soup addict in the winter.